Norah Palmer (Anna Cropper) is a recently separated script editor, who decides to temporarily move into the rural cottage that she kept as part of her split from her ex-boyfriend. Once in she is immediately struck by the strange residents in the village nearby: the superstitious Mrs Vigo, the creepy and invasive Mr Fisher, and the withdrawn and awkward Rob - real name Edgar - who practices martial arts near-naked in the forest and with whom Norah begins to feel an attraction. When unexpected events lead her to want to leave the village, however, she finds the locals conspiring to keep her trapped there. 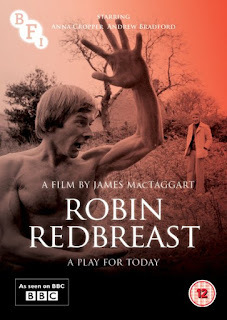 Robin Redbreast is a TV play - nowadays you would call it a made-for-television film - produced by the BBC as part of its Play for Today series of self-contained dramas. It is written by John Griffith Bowen, who would go on to write a number of Christmas supernatural dramas for the BBC, and directed by James MacTaggart. In many respects it reflects the Play for Today franchise in a typical fashion. The production budget was clearly somewhat limited, with a small cast and a very theatrical sensibility. The fashions and the dialogue are charmingly dated. The pace, by today's standards, is relatively slow. At the same time it is a rather effective horror story. It is easy to ridicule much of Play for Today's output today. Many of the plays feel charmingly naive, or tedious didactic, and more often than not hopelessly dated. To criticise them this harshly, however, overlooks what a tremendous achievement in television drama they were. Over 15 years - from 1970 to 1984 - more than 300 separate self-contained dramas were written and produced. They covered an impressive range of genres from comedy and drama to science fiction and horror. They gave early opportunities to a raft of film and television talent, including acclaimed film director Mike Leigh. Some of them led to independently successful TV series, including Rumpole of the Bailey and Boys from the Blackstuff. Like all long-running productions, some instalments were better than others, and the very best of Play for Today remain strong, dramatic works today, decades after their original broadcast. Robin Redbreast is absolutely one of the better plays that I have seen from the series. While it does begin in a rather awkward and stolid fashion it rapidly begins to slide off the rails into a uneasy and rather creepy thriller. Norah is disturbed by the strangely malevolent villagers, particularly the presumptive and eerily calm Mr Fisher (Bernard Hepton, giving what is probably the play's best performance) who tells her of Anglo-Saxon traditions and her cottage's propensity to trap birds that fly down its chimney. Norah grows wary of the simple and earnest Rob, who seems obsessed with the history of Nazi Germany and clearly has amorous designs on her. By the time the play hit its climax it had surprised me twice with the directions in which it shifted. Then, without warning, it is all over. The credits roll on an unsettling and uncertain open ending. To a large extent the small village horror and folkloric overtones of the play prefigure Robin Hardy's popular horror film The Wicker Man, released three years later in 1973. Together they help form a peculiarly British genre of 'folk horror', alongside the likes of Ben Wheatley's Kill List and Michael Reeves' Witchfinder General, and which was excellently satirised in the BBC comedy series The League of Gentlemen. These texts reflect - to one extent or another - an eerie discomfort with insular rural communities, British folklore and the unknown wilds of nature. Norah makes for a strong protagonist, and for a 1970 production she seems remarkably progressive. The play includes direct references to both contraception and abortion, and in the case of the latter it gets rather forthright and heated about a woman's reproductive rights. It came as a slight surprise to see such issues discussed so positively and yet so long ago. Like a lot of early 1970s BBC drama, the original colour tape of Robin Redbreast has long since vanished, leaving only a black and white 16mm film copy in existence. This BFI DVD release is beautifully remastered, and at least presents the sound and picture in as good a condition as can be managed. This is the second of the BFI's Play for Today DVDs I have watched (following Red Shift some weeks back) and it really is an excellent high-value set of discs.